As an AnalytiXagility user with the Standard User or Workspace Administrator role, you can collaborate with your workspace colleagues to customise certain aspects of your workspace in order to tailor it your team’s needs. This customisation can include adding project logos, branding and relevant external links. A good way to do this is to create a customised homepage for your workspace that all users will see. 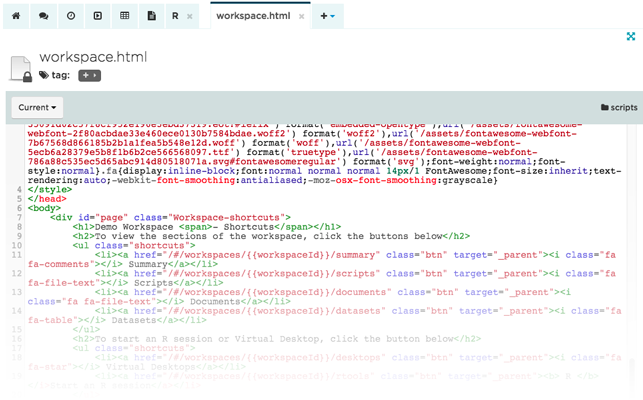 While this requires some basic HTML skills, templates to help you customise your workspace, along with additional advice and guidance, can be provided by Aridhia’s Enablement team for AnalytiXagility Ecosystem customers. To set a custom homepage for a workspace, create a file called workspace.html in the Scripts folder. In this file, write HTML code as you would for a regular web page. You cannot include content from other files, such as CSS stylesheets. Any styling must be included within the HTML file, i.e. using the <style> tag. Once you have finished writing your HTML code, save the file. If you refresh your browser window, you’ll see a new tab appear with a “home” icon. Inside this tab you’ll see your HTML code rendered as a web page. Each workspace has its own logo or image that can be customised by Workspace Administrators. To do this, click the ‘Edit workspace‘ button on the sidebar while you are inside the workspace you wish to customise. 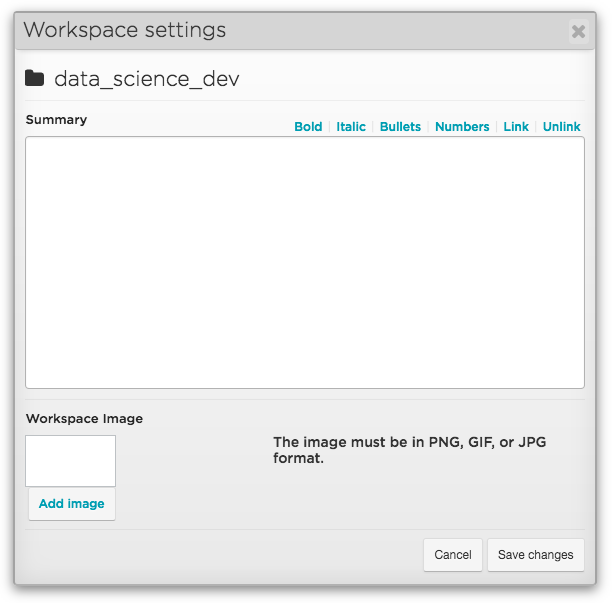 Here, you can click the ‘Change’ button in the “Workspace image” section of the popup, which allows you to select a PNG, GIF or JPG format image to upload from your local machine. Once uploaded and saved, the workspace logo will appear in the sidebar when you are inside the workspace, and also when you have selected the workspace from your workspace list.